On this U.S. Thanksgiving Day, let’s pay our respects to the Wampanoag people, who helped the refugees at Plymouth Colony through their first winter, taught them to fish and grow corn, and attended their celebration of thanksgiving after their first successful harvest. Wampanoag music is wrapped up in dance. The beat of a hardwood stick, water drum, and corn rattles is the music of their lively social dances, while appreciation and gratitude are expressed in their ceremonial dances. This according to Music on Martha’s Vineyard: A history of harmony by Tom Dresser and Jerry Muskin (Charleston: History Press, 2014). 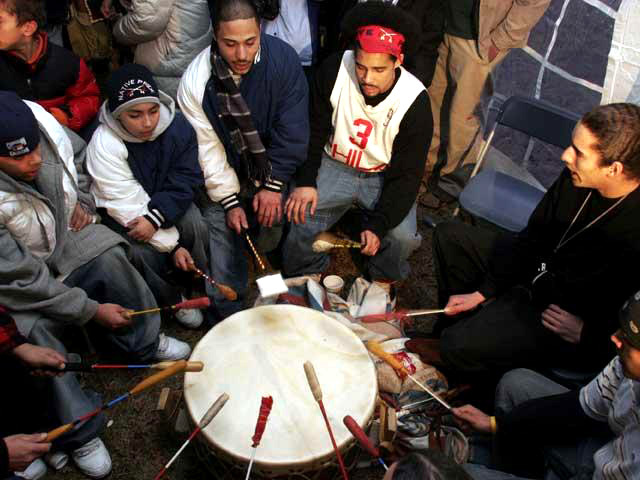 Above and below, the 2015 Mashpee Wampanoag Powwow.